The Asquith is a quaint vintage style wedding bus that is capable of carrying up to 8 passengers. 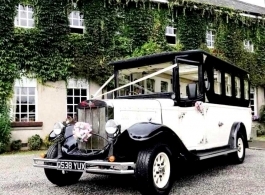 In the traditional wedding colours of Ivory White & Black, the beautifully refurbished Ivory interior is very much suited to wedding hire and has lots of space for the passengers. These vintage Asquith buses are always popular for the bride to travel in with her Father and bridesmaids but also can be used exclusively for bridesmaids, family, additional guests etc.